In excellent condition. 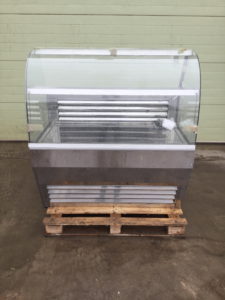 This smart looking chilled display will grace the most discerning counter or servery line. With Gucci curved glass, polished stainless steel exterior and chilled storage below the main display deck and a raised glass shelf within. Internal lighting displays food very nicely. Would suit an assisted service such as sandwiches, salads, desserts or drinks.